The PDF file equivalent to the fourth printing of Eclipse Phase is available for download, complete with a fully-hyperlinked index! Eclipse Phase is also available via print on demand! Extinction is approaching. Fight it. Eclipse Phase is the post-apocalyptic game of conspiracy and horror. Humanity is enhanced and improved, but also battered and bitterly divided. Technology allows the re-shaping of bodies and minds, but also creates opportunities for oppression and puts the capability for mass destruction in the hands of everyone. And other threats lurk in the devastated habitats of the Fall, dangers both familiar and alien. In this harsh setting, the players participate in a cross-faction conspiracy called Firewall that seeks to protect transhumanity from threats both internal and external. Along the way, they may find themselves hunting for prized technology in a gutted habitat falling from orbit, risking the hellish landscapes of a ruined earth, or following the trail of a terrorist through militarized stations and isolationist habitats. Players may even find themselves stepping through a Pandora Gate, a wormhole to distant stars and the alien secrets beyond. Eclipse Phase uses a d100/percentile system, with some twists. It's fast and simple; streamlined so players can dive into the world and action without being burdened by complex rules. Characters are skill-based, with no classes, so players can customize their team roles and specialize in fields of their choosing. A focused set of psi rules enables some characters to enhance their cognitive abilities. Play a role in a secretive and dangerous conspiracy—Firewall—that seeks to save transhumanity. Switch your body at will, from genetically modified transhumans to synthetic robotic shells, optimizing your character for specific missions. Back up your character's mind and be restored from backup in case of death--a built-in system of "Save points" and functional immortality. A setting custom-built for numerous scenario types, from faction-based intrigues to high-tech dungeon-crawls, from mind-scarring mysteries to dangerous exploration of alien worlds via wormhole gates. An eclectic assortment of intriguing factions, from techno-anarchists to future-chasing hypercorps, from soul-trading criminals to uplifted animals. A range of NPC antagonists to choose from, including rogue AIs, extreme posthuman factions, standoffish aliens with their own agenda and transhumans infected and transformed by the virulent Exsurgent virus. Eclipse Phase is available under the Creative Commons Attribution- Noncommercial-Share Alike 3.0 Unported License. This gives fans the ability to create and share free Eclipse Phase material. Whether it's homebrew adventures or hacks and remixes of the Eclipse Phase rules—go for it! When you buy Eclipse Phase, please be sure to tick the box that allows us to send you notices about updates—that way, when we make corrections, you'll get notified about it right away! Are these new pod books better quality than the old fourth editions? Because if they are not I don't see the point in you guys bothering with this. My second copy of this was when fourth edition/printing came out with the heavy weight stock, and that binding feel apart in a year and with no real use. I take good care of my rpg books also, so this was exceptionally sad. That was the book last I bought from you guys, and probably the last I ever will buy. DriveThruRPG uses Lightning Source to print. 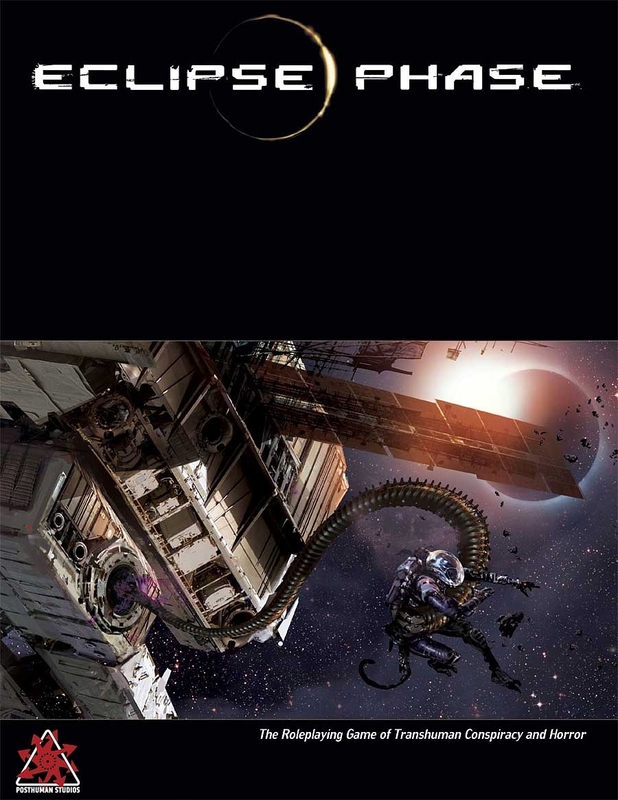 The fourth printing of Eclipse Phase was printed by the same company that did the third printing, and the same company that prints every single one of our hardcovers that are available in retail stores. You can always tell them apart from Print on Demand books because POD books don't have the cloth bookmarks in them. The books with cloth bookmarks are smyth sewn and glued; Lightning Source just glues the spines. Every traditional print run -- we've printed over 10,000 copies of Eclipse Phase -- will have a handful of defective books, which is then influenced by storage conditions, climate, etc. Please get in touch with me at adam@posthumanstudios.com and we'll make things right for you! This title was added to our catalog on August 23, 2009.